Anyone who has come across the teachings of Marie Kondo may have been inspired to lead a more minimalist lifestyle. Now that she has a Netflix series, Tidying Up, people are becoming more exposed to her methods. The KonMari methods are not only helping others spark joys within their lives but also assisting people when it comes to living a more relaxed life. 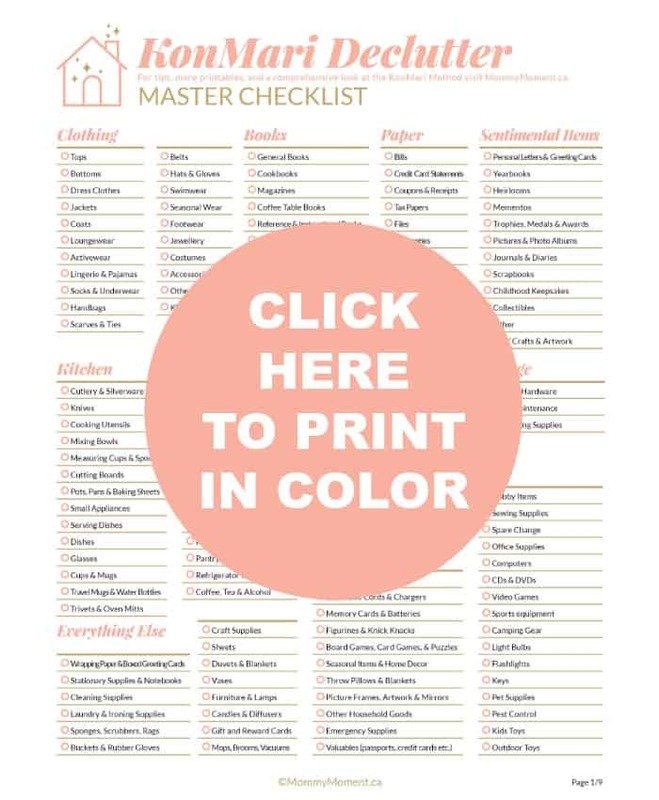 GET A FREE PRINTABLE KONMARI DECLUTTER CHECKLIST AT THE BOTTOM OF THIS POST. The truth is, clutter can quite literally cause you stress. When our homes are cluttered, it can be incredibly distracting. For many of us, clutter is something that continues to accumulate over time and until we hit a point where it’s starting to frustrate us, we may not even notice how bad it is getting. Letting go of clutter is a difficult task. In fact, it can be an emotional journey when you decide to take the steps to tidy up and reduce the stress in your life. It is important to view your home as a positive place, that has provided you with so much joy. When starting on your life-changing journey, greet your home and mindfully think about how you can better protect it the way it has protected and provided for you. 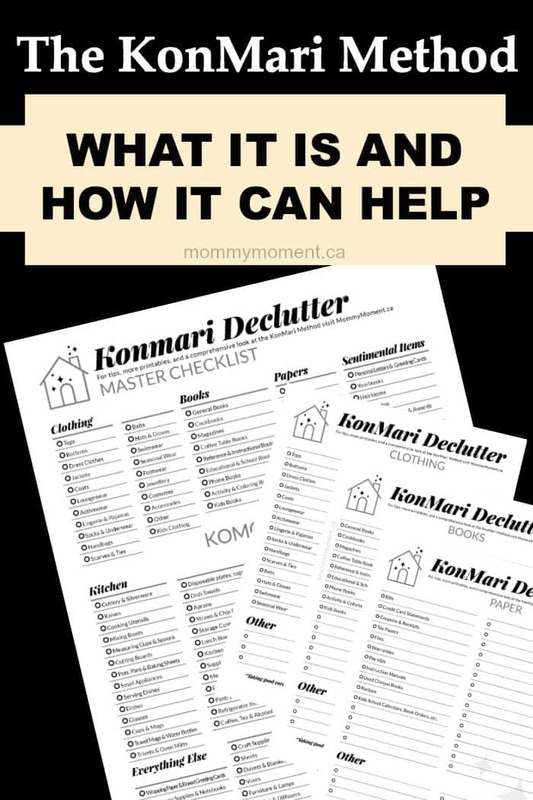 The KonMari Method is a very rigid method when it comes to organizing and decluttering your home. There are several things that make up this method and make it effective. The KonMari Method is designed around two parts: Discarding and Organizing. The basic idea is revolved around getting rid of the things that don’t spark joy and organizing the things that do. When discarding items using the KonMari Method it is important to go by category rather than by room. Gather everything from the category or subcategory you are working on and pile it all together. Once gathered, take each individual item into your hands and ask yourself if it sparks joy, making you feel happy and warm inside. Visualize what you want your future and home to feel like and if the item you are holding doesn’t fit in with what you desire, get rid of it. Discard or donate items that don’t fit, but make sure that you offer gratitude for each item you are ridding your home off. This helps you to release the item and let it go. The items that you have decided to keep should be placed in a space according to it’s category or subcategory. Each member of your household should have their own personal items in their own space. Place all your items in a way that you can easily access. It is important to avoid stacking or piling items. Shoe boxes are great tools for keeping items organized on a shelf or inside a drawer. Any clothing that you are keeping should be folded so they stand up in a rectangular shape. This is so that when you open the drawer you can see everything inside without having to move things. This method is not entirely about organizing all your things. In fact, it is more about getting rid of the things you don’t need or don’t bring you joy. The more you can discard, the better, making it easier to keep your home tidy. Hold each item in your hands, if it doesn’t bring on a feeling of joy, it should be discarded. The KonMari Method is all about your mindset. These techniques are about giving you a new mindset that causes you to want to stay tidy for the long run, rather than just focusing on dumping the clutter every so often. Rather than taking small steps towards tidying up, this method focuses on decluttering your space all at once. This will prevent you from reverting to your former cluttered ways. Tidying up should be something you look forward to rather than seeing it as a chore. While it may seem like the KonMari method focuses on storage, it doesn’t. Putting things away, only contributes to the illusion that the problem you have with clutter has been solved. 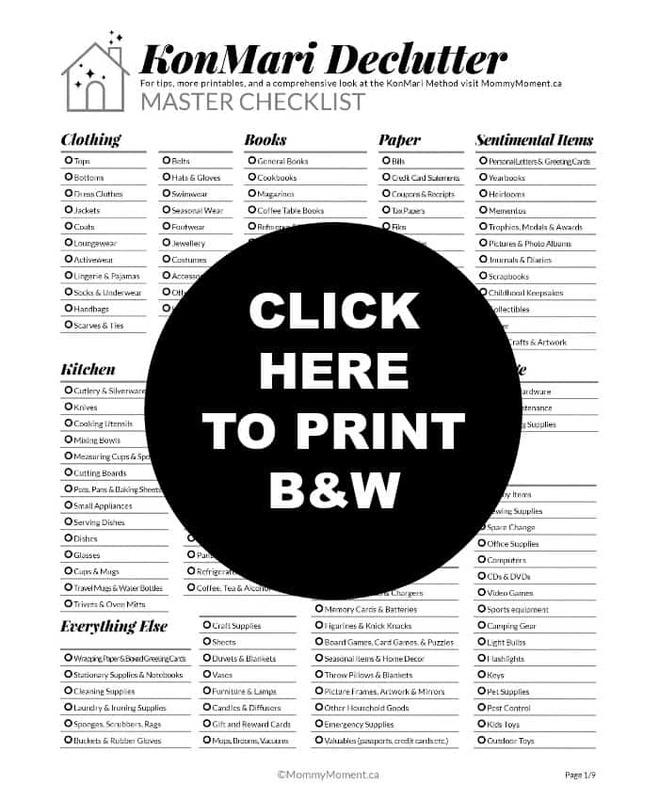 Rather than focusing on location, this method focuses on tidying by category. This prevents any confusion that you may experience why you try to declutter multiple locations at once. When followed properly, this method works. With rigid guidelines, you can not change this method to suit your own needs and personality. The solution to your clutter issues is the same no matter who you are, or why you accumulate belongings. This method is comprised of two parts. Discarding and organizing with discarding coming first. You must take the time to imagine the way you want to live and break that down into hopes and wishes. Then evaluate why you want these things. Rather than choosing what to throw away, you are choosing what to keep by holding each individual item. If it doesn’t spark joy, it gets discarded. When discarding items, you need to make sure that there is a specific order followed. Begin with clothing items, then books, papers miscellaneous items and things with sentimental value. These categories can be broken down into subcategories also. Folding your clothing is extremely important. Sparking joy isn’t all you have to worry about, in fact, your clothing must be folded according to the KonMari Method’s specific style. Never discard anyone else’s belongings without their permission. Be prepared to discard almost all documents and papers, keeping only a small collection of photographs and books. Any items that must be stored should be done in a simple manner. There are guidelines in place for what items can be stored together, where storage items are located, and the way they are stored is important. This method has a very mindful component. Not only can decluttering change your life, but it can also help to contribute to overall better health. 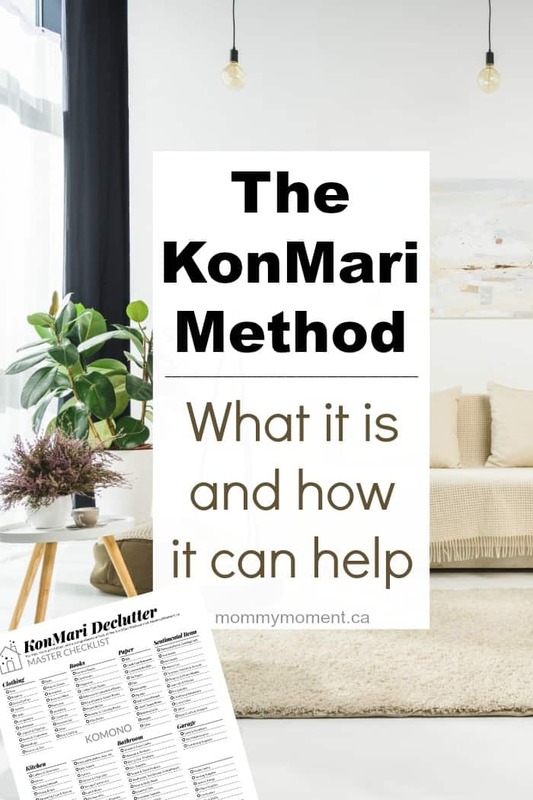 The KonMari Method encourages you to keep in mind what you want your home to feel like while you are tidying up, helping you to send your discarded items on a new journey. WHAT DOES IT FEEL LIKE TO SPARK JOY? Marie Kondo says that it is important to hold each item one by one. When you touch the items, you should feel joy. If you don’t, that item can be discarded. The feeling of joy can be compared to when you put on your favorite outfit or hold a puppy. Some people may not know how that feels but your sensitivity to joy will be discovered as you get further into the process. The purpose of Marie Kondo’s Method is a simple one. You keep the items that spark joy and discard the ones that don’t. The point of tidying up and organizing things properly is to bring happiness. This mindset also works well for other areas of your life. Once you have implemented this method, things like toxic relationships, negative thoughts, and other unnecessary things will be easier to discard. Many people operate under constant stress. Cleaning, tidying and removing the clutter in your can help people to stay focused and reduce the stress they experience. In fact, once you have completed this method, it is common to experience a sense of accomplishment and relaxation. When you declutter your space, you subsequently declutter your mind. When you release yourself from the burden of all your clutter, you will find that you feel much lighter. Not only will you feel free spiritual, but you will also feel less of a psychological burden. This sense of freedom will lead to a happier and more productive environment. The KonMari Method is an incredible way to tidy your home and declutter your mind, leading to more joy. While this method is very in-depth and rigid, with several different rules to follow, it is incredibly effective. Not only will you feel happier, reduce your stress and experience more freedom, but you will learn how to value the possessions you have, keeping your home and mind more organized. Scroll down to choose to print in your choice of black & white or in color. The KonMari Method is to be done is a specific order. Clothing, Books, Paper, Komono (Miscellaneous) & lastly, Sentimental Items. We wanted to put everything on one handy printable for you all, so please note that sentimental items should be done last. More in-depth blog posts on the individual KonMari Method categories to come! Have you tried the KonMari Method? Do you have any specific questions we can answer in coming up posts?